One of my favorite aspects about classes at Winterthur is their hands-on nature. However, what I love even more is actually getting out of the classroom and museum in order visit other historic sites. The American Interiors class I am taking this semester enabled me to do just that, by requiring all of the enrolled students to visit a site, other than Winterthur, that has a furnished interior. On a rainy Monday morning I decided to make the drive from Delaware to Lancaster County, Pennsylvania to visit the Hans Herr House and view its interior. 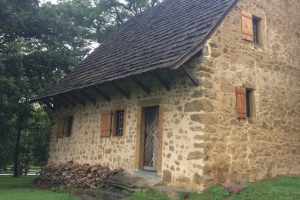 Built in 1719 by Christian Herr, this stone house was continuously occupied through the 19th century but remained primarily unoccupied during the 20th.